A gorgeous strapless lace wedding dress hangs in the circular staircase at Lowndes Grove Plantation. 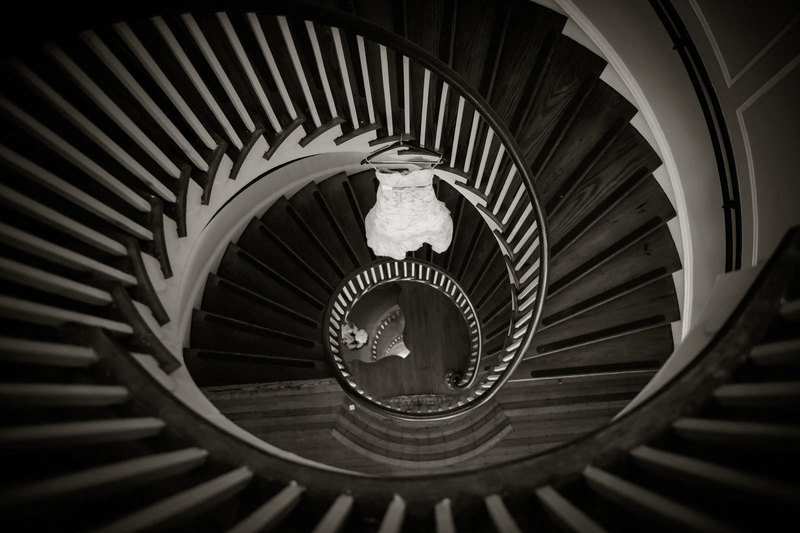 The image is photographed from above, and the lines of the banisters intersect with the circular lines of the staircase leading the viewers eye into the center of the subject of the image...the hanging wedding dress. For simplicity, and with the strong leading lines, I often prefer sepia (or black and white) toned images. They can feel more dramatic, reduce distractions, and draw the viewers eye to the subject more quickly. Priscilla and Craig were married in September in a late afternoon ceremony on the banks of the Ashley River in Charleston, South Carolina. The happy couple traveled from Chicago to their destination wedding in Charleston, along with their friends and family. We are often hired as wedding photographers for destination weddings up and down the East Coast. We find that destination weddings can be particularly fun and emotional. It is a special group of guests who are close enough to you and willing to make the big trip. They stay till the very end of the reception and soak up every moment.